Earl Winfield spent his entire 11-year career with the Hamilton Tiger-Cats, where his only appearance in the Grey Cup was during the 1989 season. During his time with Hamilton, Winfield was in the top five of many Tiger-Cat records. During the 1988 season, Winfield returned four punts for touchdowns, which ranks him first on the Tiger-Cats all-time list. During that same season, Winfield had 74 punt returns, which ranks him fifth on the Tiger-Cats all-time list. In one game versus the Toronto Argonauts, Winfield had a combined yardage of 400 yards, which ranks him third all-time in the CFL. And finally during the 1988 season, Winfield became a member of the 1,000 yard receiving club, the first of his career (he also received 1,000 yards four more times during his career 1990, 1993, 1994). During the 1990 season, Winfield finished the season with 13 receiving touchdowns, which ranks him fourth on the all-time Tiger-Cats list. 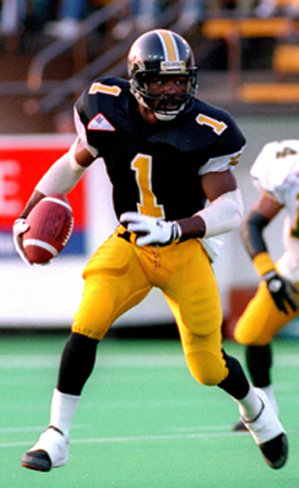 In a 1993 game versus the Edmonton Eskimos, Winfield set the Tiger-Cats record with two punt returns for touchdowns. During the 1995 season, Winfield finished with 1,496 receiving yards and 92 receptions. Both of these accomplishments place him third on the all-time Tiger-Cats list. In Winfield’s final season, he led the league with 1,320 receiving yards. In 2005, Earl Winfield became a member of the Hamilton Tiger-Cats Wall of Honour.